A symbol of excellence since 1921, Duo fold remains the most distinguished pen in Parker's discerning lineage. Driven by a commitment to superior craftsmanship, every detail of the Parker Duo fold Prestige Burgundy Chevron Centennial Size Fountain Pen is carefully thought out and executed. Brought together by hand, this individually numbered pen features a precision laser-etched chevron pattern on a metallic burgundy varnished base. The ace-emblazoned 18-karat solid gold nib is covered with rhodium highlights and creates precise, flawless lines to ensure the finest writing experience. 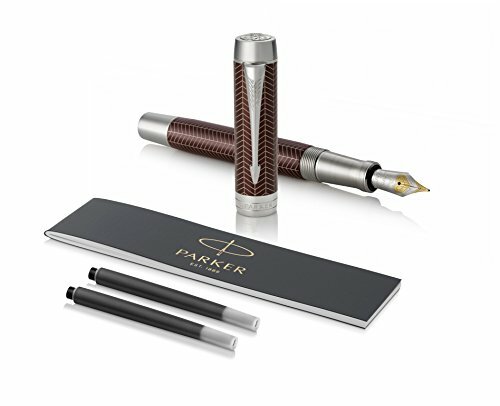 The Duo fold Prestige arrives in a Parker luxury gift box.